Poe Ghostal Offers Another In Depth Look at BlueFin’s Awesome Fan Service! – SKREEONK! Poe Ghostal Offers Another In Depth Look at BlueFin’s Awesome Fan Service! I’m Posting two days in a row? Whats the occasion, you ask? After posting ToyArk’s article yesterday, I received an email from Poe Ghostal‘s head honcho pointing me to an excellent interview he conducted with Bluefin’s Xavier Lim. The article offers even more insight into the company’s influences, inner workings, and the all-around awesomeness that surrounds geek fandom! Check it out below, and a huge thanks goes out to Poe Ghostal‘s Jason for the heads up. Good on yah, Mate! Bluefin Distribution is an official U.S. distributor for 2 branches of Bandai Japan: Bandai Collectors, known as Tamashii Nations, and Bandai Hobby, the division that produces Gundam-related model kits. The “Bluefin” is a reference to the bluefin tuna. 2.) What product lines do you distribute, and can you briefly describe them? We are the exclusive distributor for the U.S. and Canada for Tamashii Nations. What this means is that all items from Tamashii Nations that are for sale in the U.S. or Canada arrive only through our channel. We have a very close relationship with both these divisions of Bandai and work alongside them to expand and market their various product lines. Bluefin is also a distributor for other Japanese import items including: GSI Creoswhich makes hobby tools, paints and accessories. Kotobukiya, another company that makes high end collectables and model kits and more recently Square Enix, which has been making figures of various video game properties. Products we distribute can be found in specialty shops including comic, small toy, anime, collectable stores, online, and small to medium retail chains. 3.) Does Tamashii Nations USA have any input into the development of the lines it markets, and if so, how? About a year ago we wanted to become more involved in finding products that do well within Tamashii Nations’ lines to get more of a foot in the American market. Based on past data we had already discovered, certain characters and properties did extremely better than other releases within the U.S. Two of these for example were characters from the Dragon Ball series and Megaman. Tamashii Nations already had a small number of products featuring these characters and we decided to check out if there was interest in expanding beyond the initial offerings. The sales from these two properties were extraordinarily high; Dragon Ball Figuarts for example as you may now know, sold three times more in the U.S. than Japan. The Megaman Chouzoukei Damashii trading figures also comparatively did much better in the U.S. due to Megaman’s significantly high popularity here in the U.S. It still sells very well by the way. There was some obvious potential and we did a small online poll during Anime Central concerning DBZ characters just to see if there were any specific ones, U.S. consumers wanted. The results of that particular poll revived the Super Saiyan Vegeta prototype from cold storage and helped convince Bandai to start work on Trunks, both of which have now seen release specifically for the American market. And with feedback, Trunks was released with many of the features that people had posted comments about on our Facebook page such as the ability to swap heads for Normal and Super Saiyan appearance. There is MORE coming out in the future thanks to subsequent polls, and this is true for all things we decide to have polls about. There are other instances also such as Vile despite being Web Exclusive, showed significant demand by N. American fans voicing their opinions that he was allowed to be released as a general release for N. America. 4.) 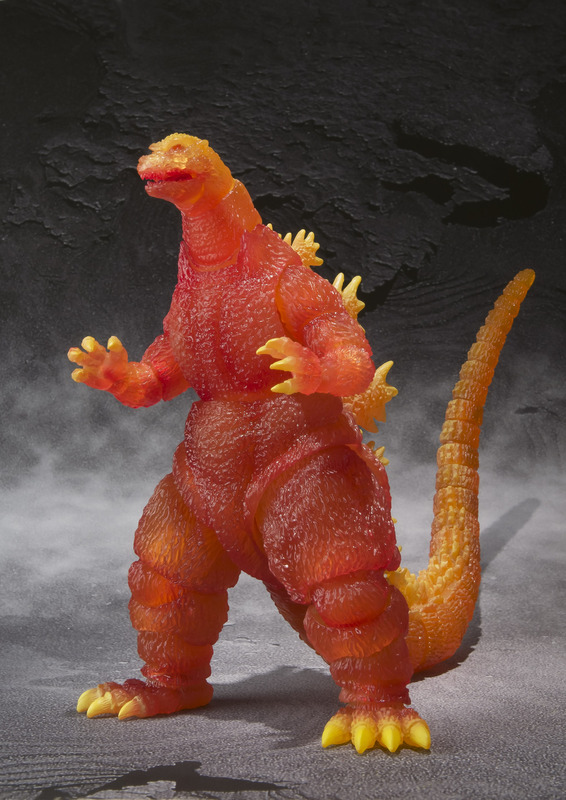 Many collectors, including me, have been waiting decades for a highly-articulated line of Godzilla and other monsters like S.H.MonsterArts. As of right now, are there plans (vague or otherwise) for any Godzilla/Toho monsters beyond King Ghidorah? Yes. Which ones? That depends. A lot of releases from Tamashii Nations follow a timing pattern. Is there something like an anniversary event or a new media release that can be tied to a product release? Is there a character that will go well with an existing release? What is trending right now? What character sparks a burning passion from fans as a potential figure? These are some of the factors used when deciding on a future release. 5.) Who creates the fantastic S.H.MonsterArts displays for the conventions (like the monsters destroying the Javits Center in NYC, or the San Diego Convention Center), and how are they made? I have been told the name of the company is “Marveling” which is a Japanese-based company. In addition to exhibits they make dioramas for actual tokusatsu sets (e.g., Kamen Rider and Sentai). Unfortunately I’m not familiar with the design process and materials to adequately explain how they are made. Thanks again to Jason, the big kahuna behind Poe Ghostal. Be sure to check out his site by clicking its name at any point in the article, or for you lazy bums – just click HERE. Posted on June 15, 2012 0 By Jon D. B.	Collector's Update! Posted in Collector's Update!, Figure Facts! Next Post BlueFin Spills It in an Excellent Interview with ToyArk! Previous Post Y-MSF’s Future Plans? Highly Articulated Zone Fighter! Ultimate Final Wars Gigan! Bandai Earthtron! Its a Collector’s Update!